Tried for product performance by Seattle Backpackers Magazine.com again this winter, Wolverine Boots’ Fulcrum Hiking Boots “fit like a glove” after a break-in period, said the author who recently re-tested Fulcrum hiking boots and commented in a review in January of this year. Waterproof and with an Individual Comfort System inside the sole, these sturdy hikers were talus-filled, mountain-tested about 250 miles, a “go-to” hiking boot that can weather fall, winter, and spring…and also last many more seasons with extreme comfort. The men’s Individual Comfort System Hiking Boots 7046 (Black) and the Waterproof Vibram Sole Hiking Boots (Brown), both of sturdy, full-grain, flexible waterproof leather, naturally resistant to oil, water, and abrasion are lined with a Gore-Tex membrane. The combination will keep your feet dry hiking or standing in the creek, which is precisely what one of the Fulcrum boot testers for Seattle Backpackers Magazine.com did last year with Wolverine’s boots when they put the hiking boots’ capabilities in real conditions in different regions in the US last year, including the Pacific Northwest and Southern California. The tester had been hiking for hours in the rain prior to standing in the water. No complaints, just kudos for dry feet! The ICS technology helps adjust the fit of the boot for comfort and foot posturing issues, such as rear foot varus (where the heel is tilted inward) or forefoot varus (where the heel of the foot is tilted outward) or over-pronation. After many excursions, the original review noted, hikers tossed out testing skepticism to discover the technology works! A small disk inside the heel of the boot can dial in preferences, which the testers noted can attribute to significant comfort, even for someone with high arches. The Fulcrum hiking boots handled mud, dirt and “excelled” on rocky, uphill treks. Not too stiff, according to the hikers sampling Fulcrum boots’ abilities, but these Wolverine Boots nonetheless ascended over steep ice and snow with crampons. And, the updated recent review noted these hikers converted easily to fit snow shoes. 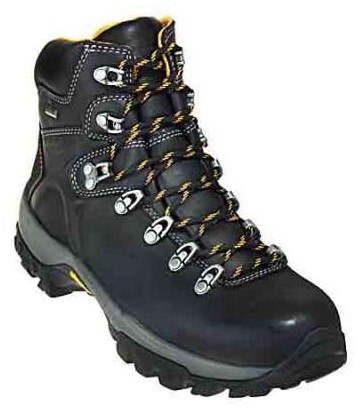 These Wolverine hikers are available at Working Person.com under the $200 price quoted in the original Seattle Backpackers Magazine review in 2012 and are hiking boots that work for the serious hiker as well as the worker who hikes around all day on the job, especially if it’s wet along the way. According to the original review by the magazine’s testers, the Fulcrum Boots are sharp enough to wear out on the town. Before you have to think about how your hiking boots will hold up, you’ll know that Wolverine’s Fulcrum Boots were put to the test. These hiking boots might be perfect for you.